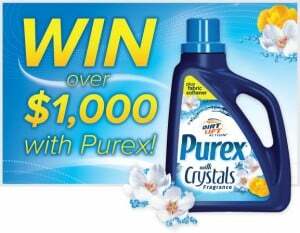 Click here to visit the Purex site and fill out the form to enter to win 1 of 500 coupons for a free bottle of Purex detergent plus Fabric Softener with Crystals Fragrance. One grand prize winner will also score $1,000 in the form of a check or gift card and a year’s supply of Purex detergent plus Fabric Softener with Crystals Fragrance. You can enter daily through March 29th. Good luck!